Julia stressed elsewhere the need for mise en place – assembling your ingredients in advance in their measured quantities. If you never ever do a mise en place for anything else, I urge you to do it for the bûche. For those who saw Julia struggling with her bûche in those early days of her show, you know the endeavor seemed jinxed, but finally she managed to pull it all together. If you have trouble with this, you’re in the very best company. 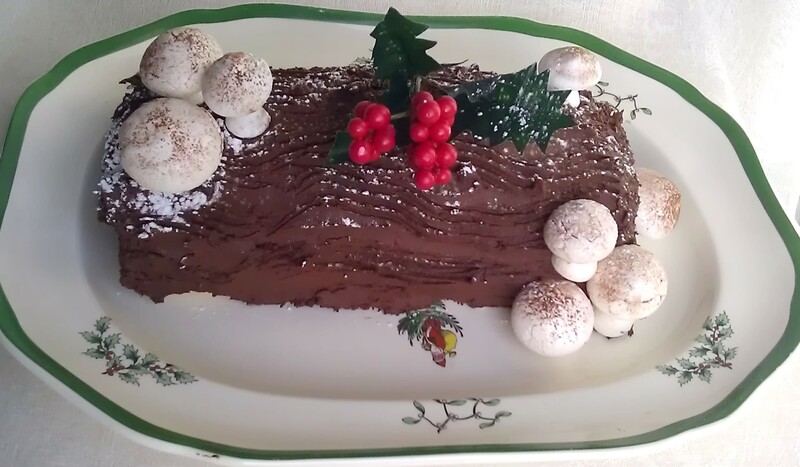 Julia’s Bûche de Noël, with Chocolate Italian Meringue Frosting is a combination of various Bûche recipes from Julia’s books. In The Way to Cook, she had left out some of the details that – for me – make the recipe easier to follow. I did not include her instructions for the “caramel veil” since this doesn’t seem botanically correct, has the potential to make a major mess in the kitchen, and the Bûches I saw in France had none. I also do not give directions for putting broken branches on the Bûche, as I never have found this an aesthetic addition. The cake recipe has the orange flavour of her orange almond Bûche, but not the pulverized nuts, so is my combination of two of her recipes. In response to a request from a reader, I have added a comprehensive list of equipment suggested, and a list of ingredients. Good luck! Preheat oven to 375 degrees with rack on lower middle level. Butter jelly roll pan, and then cover with wax paper that is two inches longer at each end. Butter and flour wax paper (using approximately ½ cup flour, and knocking out excess after moving sheet so that all parts have been covered). Start beating the 3 egg yolks in the mixing bowl, and gradually beat in the 1/2 c. sugar by tablespoon; continue for several minutes, until the mixture is thick, pale yellow, and forms the ribbon. Beat in the 1 1/2 tsp. vanilla. Beat in orange juice and grated zest. Beat the 3 egg whites, starting at slow speed, until they foam throughout. Add the 1 pinch of salt and 1 scant 1/4 tsp. cream of tartar, and continue until soft peaks are formed; sprinkle in the 1 1/2 T. sugar and beat to stiff peaks. At once, stir a quarter of the egg whites into the beaten egg yolk and sugar mixture to lighten the mixture. Rapidly plop a third of the remaining whites on top, and sift on a quarter of the flour. Delicately and rapidly fold them together, and when almost blended repeat the sequence with a third of the remaining egg whites and a third of the remaining flour, then half of each, and when you have almost blended the last of each, add and fold in the 3 T. tepid melted butter – do not over blend or you will deflate the batter. Proceed at once to the baking. Baking the sponge sheet About 7 – 10 minutes at 375 degrees. Immediately turn the batter into the prepared jelly roll pan spreading with a spatula to get into the corners; bang once firmly but not roughly on your work surface to settle it, and place at once in preheated oven. When it is done: It is done when the top just feels springy. It must just hold together; if overcooked and dried out it will crack when you roll it up. Remove from the oven, and slice ¼ inch off the long sides of the sponge sheet – they may be brittle and will crack. Sprinkle the top with 1/16-inch layer of confectioner’s sugar. One sixteenth is a light dusting of sugar, but be sure to completely cover the surface. Cover with a sheet of wax paper and a VERY lightly dampened tea towel. Turn a tray or baking sheet upside down over the cake, and reverse the two. Unmold the cake by holding an end of the wax paper while you lift off the jelly-roll pan. Neatly and carefully, peel the wax paper off the cake. I find it easier to pull the paper back almost horizontally. Beat the other 3 egg whites (room temperature) at slow speed until they foam throughout; add a pinch of salt and scant 1/4 tsp. cream of tartar. Gradually increase speed to fast, and beat to soft peaks. Turn the machine to slow as you complete the sugar syrup. Bring the 3/4 c. sugar and 1/4 c. water to the simmer, swirl the pan to dissolve the sugar completely, cover gently, and boil to the soft-ball stage (238 degrees). Beating the other 3 egg whites at moderately slow speed, dribble into them the boiling syrup – trying to avoid the wires of the whip. Increase speed to moderately fast, and beat until cool and the egg whites form stiff, shining, upstanding peaks. The meringue is now ready. Scoop a quarter of the plain Italian meringue into a pastry bag and using the ½ inch tip, squeeze out 8 to 10 ½-inch domes onto a buttered and floured baking sheet (having knocked off the excess flour) to serve as caps. I find it very hard not to get points when I lift the piping bag, but the points can be smoothed off with a slightly wet finger. Use the ⅛ inch tip to squeeze out 8 to 10 conical shapes ¼ inch high, for the stems. Bake about 1 hour in the middle level of the oven, until the meringues push easily off the pastry sheet. They should remain very light colored. They can be frozen, or stored air-tight until just before serving the Bûche. Beat smoothly melted 12 oz. of chocolate with the 3 T. strong coffee into the Italian meringue. Then fold in 1 cup whipping cream that you have whipped with 1/2 cup confectioners sugar and 1 tsp. vanilla. Remove ⅔ of the mixture to a bowl and refrigerate; this is the frosting. Gently unroll the cooked cake, and spread the filling over the top. If the filling is too thin, refrigerate for about 15 minutes and test again. A couple tablespoons of cocoa can be beaten into it to make it firmer. Roll it up from one of the short sides, and you have made a log. You may need to gently release the bottom of the cake from the waxed paper as you are rolling so that it doesn’t stick. Neatly slice a narrow slanting piece from each end of the log. Using an offset spatula inserted under one end of the log, transfer it to the serving platter placing it seam side down. Slip double sheets of wax paper under the edge of each side and the two ends to catch spills. Leaving the two ends unfrosted, frost the cake using a flexible metal spatula, and then use a fork to give it a bark-like look. Remove wax paper. Cake can be refrigerated at this point, covered. With a small knife, piece a hole in the bottom of each meringue mushroom cap, insert a bit of the frosting (or softened butter) into the hole, and then the pointed end of the meringue stem. Dust the mushroom tops with cocoa powder tapped from a very fine sieve. Arrange the mushrooms in tasteful clusters on the log. Dust the log with a sparse coating of confectioner’s sugar to give a snowy effect. I’m so glad my blog post was helpful. It was my tribute to Julia. Nancy, these conversations are from a long time ago, but thanks for the easy to read recipe. So much nicer than having my cookbook out. I made my first Buche today and it was a great hit. Especially the meringue mushrooms. The orange flavoring is really nice. I even enjoyed it after cooking for 2 straight days – 21 hours total. Generally by Christmas dinner I am too tired to sit down and enjoy it. But this year I did and thank you again! If you’re looking for a shortcut for this fabulous cake – head on over to http://www.enchantedbakeshop.com to buy homemade meringue mushrooms. Made from a special recipe, they won’t get soggy on your cake, even overnight. I have made Julia’s buche de noel many times for my son’ s early January birthday. I have made the Italian meringue frosting as well as Julia’s chocolate ganache recipe. I use ganache when the humidity is too high for the meringue. I then substitute marzipan for the meringue and make the mushrooms with marzipan. It is a better alternative to meringue that would become soggy in high humidity. I prefer the marzipan from Germany that is typically available from World Market, I generally gently squeeze the tube or package of marzipan before I buy to determine the freshness. A hard tex ture will not roll. I also flavor the ganache with Grand Marinier to complement the orange in the cake, unless you prefer rum. Bon appetit! Thank you for your comments and suggestions. When I do the faster version, I too use marzipan. I sometimes used red paste food color to make the mushroom caps red. I made this recipe for Christmas dinner and it was a huge success! Thank you very much! I am an experienced cook, but I still had some problems with the flour although I managed to figure it out. I think that I may have a suggestion that would deal with some of the comments about the ingredients. Why not incorporate two lists of ingredients into the recipe, a summary list of ingredients for shopping, and a second list that is broken down by the major preparation steps? Two other minor suggestions. First, in step 6 under Cooling and Unmolding, this may not be obvious to everyone, but the cake should be rolled “tightly.” Second, a preparation schedule could also be added to the recipe. I made the cake and meringue mushrooms on Tuesday, filled and frosted the cake and assembled the meringue mushrooms on Wednesday, and decorated the cake with the meringue mushrooms and the holly on Thursday (Christmas Day). I will definitely check out the other recipes on your website. Thanks again! Great comments. As I recall Julia had the ingredients by step, and then one very frustrated reader asked to list them all at the beginning. If I have some extra time one day, I may try to put the ingredients in by step. I think I’m going to be tweaking these instructions as long as I live! I will have my husband put a link to a post I did on rolades that has a video. A picture is worth a thousand words, etc. etc. I have gone back and put ingredient amounts at each step. If you wouldn’t mind proof-reading it for accuracy and clarity, I would greatly appreciate it! A fragment of a sentence got left out in the (now up to 26) revisions. The first vanilla extract is put into the batter base. The second amount of vanilla extract is put into the whipped cream that is part of the frosting. Can you check me again? Thank you so much, Laura. My eyes glaze over after so many re-readings. I’m glad to say that none of the other recipes comes close to this in complexity. I am i the middle of the recipe and cannot see when I should add the orange zest and juice. The orange is only mentioned in the introduction and the ingredient list. I would guess at the same time as the melted chocolate? 1. Start beating the egg yolks in the mixing bowl, and gradually beat in the 1/2 c. sugar by tablespoon; continue for several minutes, until the mixture is thick, pale yellow, and forms the ribbon. 2. Beat in the vanilla. 3. Beat in orange juice and grated zest. Its nice to have the whole list but very confusing when you just say “add sugar” in the recipe. Even tho you say in one of your comments to use them in order, when you’re putting the flour and yolk mixture together it was completely unclear to me how much flour to use and when! It will be a miracle (cake is in the oven now) if it comes out OK.
I’ll go back and get the answer for you. Sorry! You should have seen the recipe before I brought it together from at least 4 different places in The Way to Cook! I’ve gone back and added the sugar amounts in both places. When editing the recipe, at some point I put in a 1/2 c of flour in the ingredient list that shouldn’t be there, and the proper amount is 1/3 cup plus 1/4 cup – 9 T. This is is added to the batter as described in “finishing the batter.” My deepest apologies!!!! I tried to reply, but it may have gotten lost in cyberspace. I’ve added the sugar amounts in the 2 places. The 9 T. (somehow an extra and incorrect 1/2 cup of flour had been added to the ingredient list) and the 9 T. (not 12!) are what 1/3 plus 1/4 cup of flour are. They are added as per “finishing the batter.” I thank you for bringing this to my attention, and can’t apologize enough. I hope you had a miracle! Just go step by step. The ingredients are used in order listed as I recall. I always trusted Julia, and hesitate to try to improve on her work, although what you ask makes sense. If I were younger and had more energy, I might give it a try. Why don’t you consider the fool-proof version I posted. It is much less stressful! Yes, you take the chilled whipping cream and whip it and then fold it in. Your list of ingredients and instructions are confusing. I want to find out the proportion of sugar to water for the syrup and it is indecipherable to me. Ramon, you’re right – they are confusing. I went back to my original post and found these ingredient amounts for the sugar syrup: ¾ cup sugar, a pinch of salt, ¼ tsp cream of tartar, and ¼ cup water boiled to the soft-ball stage – 238 degree F.
I followed your recipe and the Buche de Noel turned out great. My husband is French and I wanted to surprise him with a traditional French meal and dessert. He loved it and thought it was just like home. Thank you for sharing this online, otherwise I never would have been able to make it! Nicole, you have made my day! That is exactly why I did the post , and I am so glad all went well. I’m sorry, but your comment was cut off after “hoping.” What happened?! Just went to your post and saw the successful outcome. Great work! sure would be nice if you put all ingredients at the top. how this is laid out is confusing and you have to sift through all the instructions to figure out what to buy. e.g the top talks about egg whites but doesn’t mention the whipped cream so i’m not sure what is needed + no mention of chocolate until way down. i’m a very experienced cook and would love to try it, but spending 20 min trying to figure out what to purchase is a pain! We will work on it. I copied Julia’s instructions from her final book, feeling these would be best. Thanks and a very Merry Christmas to you as well! Comprehensive ingredient list is now at beginning of instructions. Wanted to let you know that in Julia’s recipe that I am still looking for, she used just egg whites and cream of tarter for the mushrooms, that you baked at a low oven for hours! In that recipe she also said to poke the hole in the bottom of the mushroom where you are going to add the stem and paint the entire bottom of the mushroom with chocolate and then poke the stem into the hole. Painting the entire bottom of the mushroom made them look so real, along with a very light dusting of cocoa for the top! Still looking for the recipe in a magazine from the 1980’s thru 1990! Someday I will find it and make it again! I am not giving up! The egg whites and cream of tartar make a traditional meringue that bakes in a low over for a long time. Joy of Baking.com has a recipe for meringue mushroom that sounds like what you describe. Julia did several recipes over the years, so keep looking! That would be 12 Tbsp flour since 1/8 C is 2 Tbsp. Can you tell me, please, to what you are referring in the recipe? I think I see where you have found an error. Your calculations looks absolutely right. Hopefully, people have just used the 1/2 and 1/4 cup measurements. Unfortunately, it is complicated. You can do the cake ahead and freeze it (although I’ve never done it). The easy way is to make the foolproof version. I would LOVE to have Julia’s recipe that was on the October or November cover of either BonApetit or Gourmet in the late 1990’s that I bought in Fort Myers FL. It has 2 sauces that she painted on the sponge cake. I made it for Gourmet Club and want to make it again now that I am retired! Can you help me find the actual recipe? I would be forever grateful! It took me 2 evenings and 1 Sat to pull it off! It was beautiful! My husband doesn’t like chocolate and this had only a tiny bit of chocolate in the cream on the inside of the cake! I painted the egg white on the outside and he went to the garage and brought in his big blow torch (I didn’t have the small one then) and we darkened the log! It was beautiful! The closest thing I could find was Julia’s Holiday Roulade from her book, “The Way to Cook.” It uses the orange-almond cake from her buche recipe and has a meringue-based filling and a meringue frosting that perhaps you browned. There is no chocolate. It is painted (or sprinkled) with a rum syrup before being filled. I couldn’t fine it anywhere free on the Web, and it would take me a long time to copy it, but “The Way to Cook” is a wonderful book to have in your kitchen library. Thank you so much for the improved instructions. I’m tackling this Saturday and I was losing my nerve after wading through The Way to Cook. One question: is there a reason you omitted the almonds from the sponge? Thank you so much for writing, Gretchen. I think I omitted the almonds because my husband hates nuts in any form. I think the recipe Julia first demonstrated in the 60s on TV included nuts, and I tried to make it back then, but didn’t realize how little the sponge needed to bake to avoid cracking. Either way, you’ll be fine. I made my first log two weeks ago for my daughter’s 8th grade French class. It came out amazing. Much like M. Lam, I’m working without a Kitchen Aid and had to whip my meringue by hand, so the peaks didn’t stay quite as stiff as I would have liked. The caps of the mushrooms had no problems holding, but the stems wouldn’t stand up straight. I improvised and just piped the meringue into ribbons. It worked out fine because I attached the mushrooms to the sides of the log, so the more two-dimensional quality didn’t pose a problem. Actually in case where I made mushroom “clusters” it actually helped. I also used a mint leaf and some whole cranberries I candied to make the “holly” and then tossed the cranberries and some fresh raspberries around the base. All in all, it came out quite well for my first attempt and it received many compliments, so I felt the time was well worth it. Thank you for the straightforward (easy doesn’t seem the right adjective) directions which allowed me to keep a promise I made to my child when she started taking French class! Congratulations! Actually, this year, I used another meringue recipe a few days before to make the mushrooms, thinking if I couldn’t achieve the mushrooms, I wouldn’t be able to do the buche. A baking site says to make extra stems because they tend to fall over – perhaps that’s why Julia says to only make them a quarter of an inch tall. I applaud your ability to make “live” holly. Bravo – you are a really good mother! Thank you for such terrific, detailed instructions! I was searching for a buche de noel recipe and happened upon your blog. Followed it to the letter today and everything turned out beautifully! It was enough for me to cut off a piece of the cake to frost and decorate for dessert this evening and then give a “log” as a gift. My mushrooms turned out perfectly, much to my surprise. Unfortunately, living in Florida, the humidity, even though it was a beautiful day today, is just too much for meringue, so my mushrooms did not stay light and crispy for long. But, they looked great! I hope you are well again soon. I have enjoyed my brief visit to your blog. Merry Christmas and thanks again. I am delighted the instructions worked for you. You certainly did better than I did the first time around! My goal was to make Julia’s recipe accessible for anyone who wanted to try it. Thank you so much for letting me know how you did. I’ve wondered if people would be able to follow the directions. If you did this well on your first try in a kitchen without all the equipment, you’re amazing! Wow – what a process! A great way to celebrate – this looks wonderful. Looks so festive! Cudos to you for having the patience to perform all those steps, I wouldn’t have the endurance! I enjoy your blog, you are not afraid of a challenge. Keep up the hard work! Thank you, Jane. You are such an encouragement! This looks fantastic! Congratulations for all your hard work! Butter curls, butter balls, butter rosettes, etc. Jamie Oliver's "Rhubarb and Custard Kinda Soufflé"
Baker on the Rise Baking through Baking with Julia in Tuesdays with Dorie, and other great baking recipes.